Even with a wealth of content to explore the number of games that explore Norse mythology in detail are still somewhat limited even more so in the action RPG genre. Vikings – Wolves of Midgard aims to counter this trend with a Diablo inspired game that draws on the cold Viking history for inspiration. Players are able to customise their own Viking warrior right from the start of the game with gender, hair, jewellery, tattoo and beard options. Alongside the visual customisation you’ll pair it with your own Deity which defines your class with the likes of sword and shield, dual wielding, tow handed weapons, magic and bows. Following the end of the Viking world you’ll take your designed hero into the game world as the hero that could save it all. Said world offers some room for exploration with side quests littered throughout the more linear main story line environments which include cold mountains, settlements and more fantasy inspired settings. All of this of course culminates in gear, skill and other progression which takes your basic Viking to powerful fighter. Combat is where you’ll spend most of your time of course with Vikings – Wolves of Midgard offering a fast paced flow that focuses around a mixture of basic attacks, dodges and your available skills which unlock over time as you use a particular weapon (each linked to a Deity). Players aren’t limited to a single weapon type but of course the benefits of specialisation cannot be overlooked especially with the tough difficulty the game throws at you. Other mechanics of Vikings – Wolves of Midgard are kept streamlined with item crafting, stat points, potions and even skills all easy to grasp and manage which keeps you more focused on the action than having to spend ages considering points distribution. Other subtle game mechanics also make for an interesting experience such as dealing with the elements that require you to balance your exposure to the cold air with the lit fires spread across maps. Vikings – Wolves of Midgard is a passable alternative to the popular action RPGs and helps stream line the experience perfectly for the console market. It’s still a decent option in the PC market as well but can’t quite stand against the most popular titles in a direct comparison. 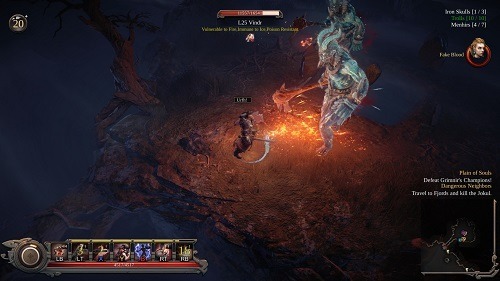 Action RPG style game across multiple platforms. Streamlined skill, potion and stat mechanics keep your focus on fighting. Fight off the elements of the environment. 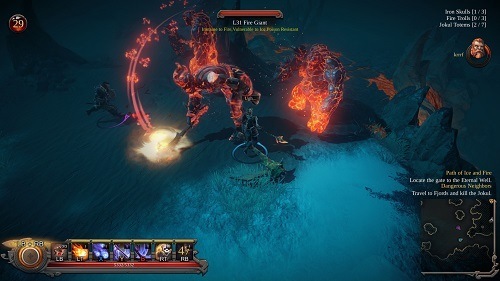 Various boss battles with their own unique mechanics.